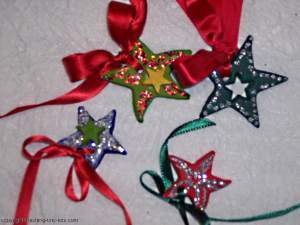 Cute Christmas Stars you can hang as tree ornaments, decorate wreaths, hang in windows or tie on a gift. Make Dough as Directed in the Salt Dough Recipe link provided above. 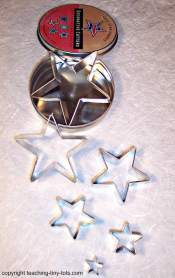 Using star cutters, cut out stars in various sizes. Cut a few small stars inside of a larger one for variation and keep them to glue onto the larger stars. When the dough is dried from baking, brush off excess flour and begin painting the each of the stars. 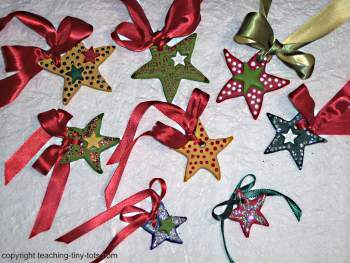 Glue on small stars onto the larger ones using Elmer's white glue. Be generous with the glue, it will dry clear. Allow to dry overnight if possible. The next step is to paint the details on the stars with the white puff paint and the 3-D red and green. 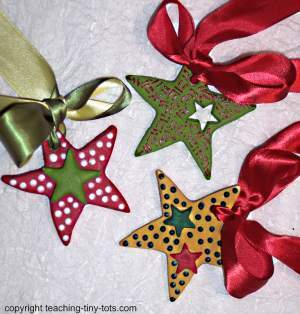 Make polka dots or draw lines with Elmer's glue on the stars and sprinkle with glitter. Tie on ribbon and they are ready for decorating your tree, wreath, windows or tie on a gift. See photos for Christmas decorating ideas. Write name and date on the back.